BY PATRICK COX: A recent study reported that 40% of American women are now obese; the highest percentage in history. Men have a slightly lower rate of obesity at 35%. The opposite has happened. Abundance replaced scarcity, which brought a new problem: obesity. The abundance of adipose tissue is the most obvious sign that we’ve entered the age of abundance. Go to any mall and you will see that we are increasingly obese. This is not just perception. It’s a statistical fact. Being fat is a source of serious personal angst for many people. My concern, however, isn’t about the feelings of obese people. I feel no desire to shame people for their BMI. The problem I have with obesity is strictly and personally financial, as I view it as a larger economic and societal problem. More than a third of the US population has a body mass index (BMI) of 30.0 or higher, the definition of obesity. A third of the population is overweight (BMI of 25–29.9), and slightly less than a third is considered normal weight (BMI less than 25). As an economist, I can’t ignore the fact that obesity significantly increases healthcare costs, even if it hurts feelings. It’s interesting that so many people in the fat acceptance movement are proponents of “free” healthcare. Yet, they don’t seem to grasp that their obesity is causing serious financial problems for our entire society. Obesity increases the risk of diseases ranging from type 2 diabetes and cardiovascular disease, to fatty liver disease and Alzheimer’s. As a result, negative medical consequences and costs increase geometrically along with the degree of excess adipose tissue. It’s estimated that healthcare costs for severely obese adults are 81% greater than costs for healthy weight adults. 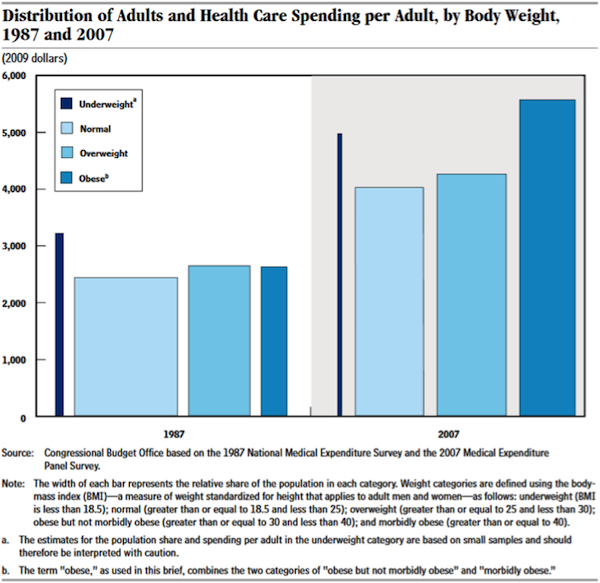 Obese adults also spend 42% more on direct healthcare costs than those of a healthy weight. 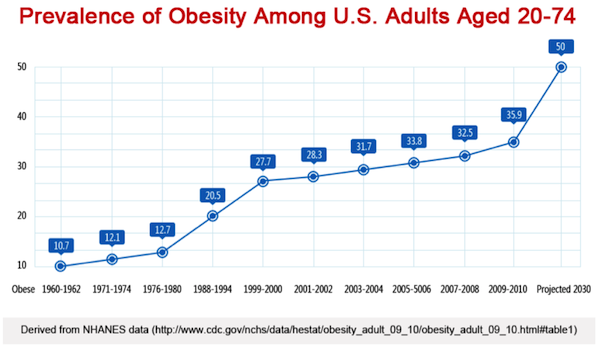 The following chart is somewhat dated, but it shows the ongoing trend of increasing obesity and increasing healthcare costs. And we are all required to subsidize those individuals’ medical care. Our bodies have protective genetic mechanisms that store energy in fat cells. These mechanisms helped our ancestors survive during rare times of plenty. As such, it’s hard to overcome our programming and voluntarily endure hunger. I’ve had great success in reducing weight with my variation of Valter Longo’s fasting mimicking diet (FMD). This diet replicates the ancient cycles of feast and famine that our ancestors routinely endured. Few seem interested in it despite Longo’s supporting data, though. That means more radical medical interventions are required to get the population’s BMI under 25. A number of therapies have been shown to work on animals in the lab. This includes brown adipose tissue transplants, vampire (GDF11) therapy, and growth hormone releasing hormone (GHRH) vaccines. I have no doubt, however, that we’ll solve the obesity problem. That’s because the healthcare costs for obese individuals will bankrupt us if we don’t. We already spend more than we take in to pay the medical costs of an increasingly older population. Now with the steady rise in obesity rates, regulators will eventually have to remove the obstacles that are keeping legitimate obesity cures off the market. If you’re looking for a unique, informed view of the biotech, science, and technology stories that could impact your health and investing portfolio, sign up for Patrick Cox’s free weekly column, Tech Digest, at Mauldin Economics.